Whether it's to help you get going first thing in the morning, a pick-me-up during midafternoon or an energy booster before your gym session, a cup of steaming java easily becomes part of your daily routine. The good news is that plain coffee won't have any negative effects on your weight-loss attempts, and it could even prove to be beneficial. If you struggle with cravings and hunger pangs when dieting, coffee may help to suppress your appetite, according to Jennifer Koslo of Precision Nutrition. While this effect has often been attributed to the caffeine content of coffee, decaffeinated coffee can have the same effect, notes Koslo. Therefore, switching to decaf may be an effective way to control hunger without overdoing the caffeine. According to Aditi Majumdar and Dr. Len Kravitz of the University of New Mexico, caffeine may increase the release of free fatty acids in the bloodstream, which helps you work harder for longer. Caffeine is also an energy booster and can help mental focus by making your natural neurotransmitters serotonin, dopamine and acetylcholine more effective. It also stimulates the release of adrenaline, increases blood flow to your muscles and speeds up your heartbeat, notes Susan Roberts, professor of nutrition at Tufts University. All these lead to a more focused, energized training session, which may help you burn more calories and lose weight faster. What type of coffee you drink will make a big difference as to its effect on weight loss. A regular black coffee or espresso is virtually calorie-free. Sugary coffee drinks, or those made with cream, whole milk and syrup, can contain a high number of calories. According to an article on the Today website, a large mocha can contain between 400 and 580 calories, while an iced cappuccino with syrup can have over 600. Be aware of the ingredients that go into your coffee, as well as any extras you may add. In addition to its appetite-controlling effect, coffee may increase your rate of calorie burn. According to a study from a 2006 edition of the "American Journal of Clinical Nutrition," coffee's caffeine content may elicit a slight boost in thermogenesis and fat oxidation. This result is likely to be minimal at best, however, so while it may help, you shouldn't pin your weight-loss hopes on a few cups of coffee. Precision Nutrition: Research Review: How Does Coffee Affect Your Appetite? University of New Mexico: Caffeine: Women's Weight Loss Breakthrough or Bust? 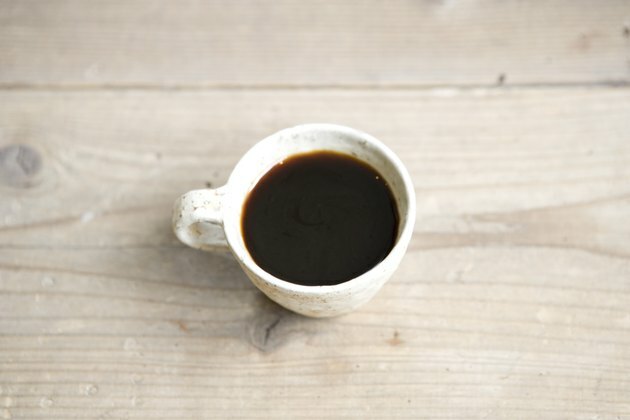 Tufts Journal: Ask The Professor Why Does Caffeine Give You Energy?